The rejection of the Academy and the pursuit of nature. Sir Joshua Reynolds, Self-portrait 1748. -“intellectual dignity” : which was culled from heaven and arrived at by mental labour. -simplicity of nature based upon antiquity ie NOT based upon the faddish or the contemporary. James Barry (1741-1806) Self Portrait, 1803. Sculpture - Hercules crushing the serpent Envy. Note the date: Barry was 60 years old. He paints himself as the young hero he once set out to be. The painting he holds is Sleeping Cyclops. This is his version of Pliny’s description of a painting by Timanthes, the early Greek artist famed for his naturalism. 1777-83 Barry painted - at no charge - The Progress of Human Culture for Society of Arts. “Who will dare say that polite art is encourages or either wished or tolerated in a nation where society for the encouragement of Art suffer’d Barry to give them his labour for nothing, a society composed of the flower of English nobility and gentry? – suffering an artist to starve while he supported what they, under the pretence of encouraging, were endeavouring to depress – Barry told me that while he did that work he lived on bread and apples.” William Blake’s marginal comments of Reynolds’s Discourses. The object itself is real but its identity is to be judged against an ideal reality which exists in the natural conception of the object. The recognition of this ideal is a problematic for artists. The person, argues Reynolds, who has viewed as many examples of an object as possible is the one most able to discern the degree to which it coincides with the ideal. "Damn Nature! she always puts me out!" “the Poetic Genius is the True Man!” William Blake. Jean Jacques Rousseau, Discourse on Inequality in 1750. Edited and translated into English by Brooke Boothby . Here in an obviously stage managed portrait. In his hand is Confessions, Rousseau’s autobiography. Rousseau’s fundamental idea was that the contemplation of nature could be illuminating and liberating. By encouraging us to experience feelings internally nature might lead us to truth. Hitherto emotion had been mistrusted, seen as anti-philosophical. In the pre-Rouseau world the seeker after truth was cold and calculating. Thereafter the Man of Feeling (the name of a novel by the Scottish writer Henry Mackenzie pub 1771) could use emotion to work out what was virtuous in the world. 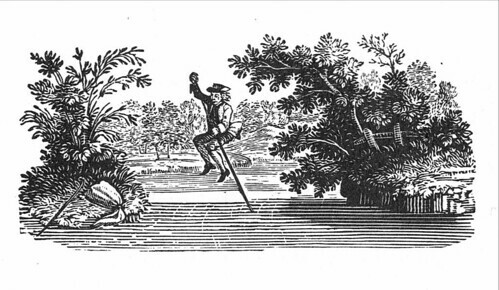 Rousseau believed the man was fallen from a state of nature. This original state represented the core of truth which the philosophical contemplation of feeling and nature was calculated to revive. For Rousseau this original state was essentially moral, stable and good. For Rousseau natural man was good and lived in a harmonious and beneficial commune with the world and all the creatures in it. The men (and ladies) of feeling were also interested in early societies; antiquity promised closeness to nature. Some of the late 18th century preoccupations now seem elaborate, overwrought and misguided; the cult of Ossian for instance. The supposed Northern bard was largely a fiction created (1762-3) by its “translator” James MacPherson. “Had I been a painter I never would have copied the works of “Old Masters”…. I would have gone to nature for all my patterns, for she exhibits an endless variety – not possible to be surpassed and scarcely ever to be equalled….. in art nothing is worth looking at but such productions as have been faithfully copied from nature.” Thomas Bewick, Memoir written 1823. Next week: Art skills for the working man: industry and the Government art scheme (South Kensington, John Ruskin) 27th October.